Hatters boss John Still is anticipating a game of few chances when his side travel to Plymouth this afternoon. The two teams have the division’s joint second best defensive records, conceding just 17 goals all season. Still said: “I think lots of the games are tight, so I wouldn’t think it will be anything other than keenly contested. Both sides go into the game searching for their first wins of 2015, but Still wasn’t unduly concerned about facing a Plymouth team who had gone four matches without a victory. He said: “I’m not really worried about if teams are doing good or doing bad, I just know if we go and play anywhere against anyone and we’re up to the form that we’re capable of, we will do well. “It’s how you look at games sometimes as we drew with Shrewsbury, we drew with Portsmouth, we drew with Wycombe. “Against Wycombe and Shrewsbury, who were the two on paper better sides, we were good enough to win those games and I think we probably might have deserved to win those games. 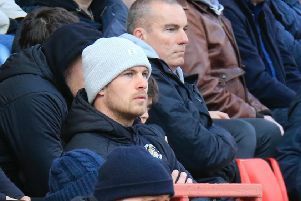 Town lost the reverse fixture with Plymouth 1-0 at Kenilworth Road back in September, although Still wasn’t reading too much into that as he added: “At the time I thought they were a decent side, but we weren’t firing on all cylinders then.